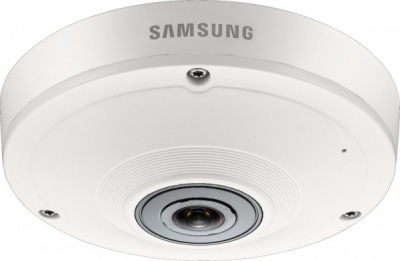 The Samsung fisheye camera features 5MP at 20 fps which captures smoother video at a higher framerate with true day and night function. Built-in on-camera dewarping allows instant access to single PTZ, quad view, and panorama views. Bi-directional audio allows greater situational awareness. The micro-SDXC memory card slot creates a cost effective edge recording solution. Alarm triggers include intelligent motion detection, audio detection, tampering detection, alarm input, and network disconnection.